I think I just found a bug in the class.jumicoder.php file. You are absolutely right! God bless you! First of all - GREAT WORK ! You're a life saver ! I'm rather new to Joomla and we are creating a MEGA MENU for one of our websites. I have the js, css and html ready. But i am unable to add that to the top position on my template. Any help will be appreciated. I'm a 1 man startup - just starting off on Joomla. If I could - would have hired your services. But for now - if you can give me some directions, I'll work on it. 1. You can include it directly into the template - they will be there fixed. 2. Or you can include them via Jumi on the fly - and they will be only on the paces where you need them. I will discuss the 2nd case here. This is technique known as injection and Joomla has its own object ($document) and methods for this. I hope it is clear enough. If not there is a good documentation with examples in http://docs.joomla.org/ - see API reference. 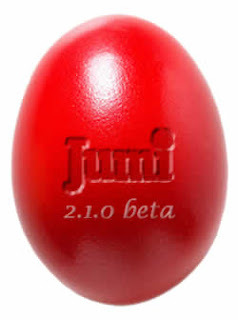 The previous version of Jumi on our site did not care.